Search for Lady Jane Grey in CBW. Find Lady Jane Grey on the Pop Chart. Jane was the eldest daughter of Henry Grey, third Marquis of Dorset, and of Frances, daughter of Charles Brandon, Duke of Suffolk. Her date of birth is not known precisely, but it is now believed to be sometime in the year 1536, at her father's stately mansion of Bradgate, near Leicester. Her father provided her with two learned tutors in his two chaplains, Thomas Harding and John Aylmer. 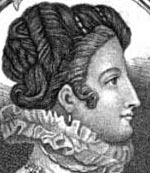 The majority of her charge being given to Aylmer, Lady Jane soon gained a thorough acquaintance with Latin and Greek, and also some degree of proficiency in Hebrew, Arabic, Chaldaic, French and Italian. These tutors also served as her religious instructors, and Jane became a devout Protestant. In addition to her incredible linguistic achievements, she possessed wonderful musical and vocal talents; excelled in needlework and embroidery; was skilled in the culinary arts; and was gifted in calligraphy. At an early age, then, she stood out amongst her peers. My duty to your lordship, in most humble wise remembered, with no less thanks for the gentle letters which I received from you. Thinking myself so much bound to your lordship for your great goodness towards me from time to time, that I cannot by any means be able to recompense the least part thereof, I purposed to write a few rude lines unto your lordship, rather as a token to show how much worthier I think your lordship's goodness than to give worthy thanks for the same; and these my letters shall be to testify unto you that, like as you have become towards me a loving and kind father, so I shall be always most ready to obey your godly monitions and good instructions, as becometh one upon whom you have heaped so many benefits. And thus, fearing lest I should trouble your lordship too much, I must humbly take my leave of your good lordship. Her parents acted upon the maxim that to spare the rod is to spoil the child; and notwithstanding her amiability and honourable diligence, subjected her to a very severe discipline. She was rigorously punished for the slightest defect in her behaviour or the most trivial failure in her studies. Her parents taught her to fear, rather than to love, them; and insisted upon reverence, rather than affection, as the duty of children. It is no wonder, therefore, that from the austere brow and unsympathetic voice she turned with ever-increasing delight towards that secret spirit of knowledge which has only smiles for its votaries. In the pages of the wise she met with divine words of encouragement and consolation; they soothed her sorrows, they taught her the heroism of endurance, they lifted her into that serene realm where dwelt the Immortals—the glorious minds of old. "Thus," says she, "my book hath been so much my pleasure, and bringeth daily to me more and more pleasure, that in respect of it all other pleasures in very deed be but trifles and troubles unto me." "I wis," she replied, smiling, "all their sport in the park is but a shadow to that pleasure that I find in Plato. Alas! good folk, they never felt what true pleasure meant." "And how came you, madam," quoth he, "to this deep knowledge of pleasure? And what did chiefly allure you unto it, seeing not many women, but very few men, have attained thereunto?" "I will tell you," quoth she, "and tell you a truth which, perchance, ye will marvel at. One of the greatest benefits that ever God gave me is that He sent me so sharp and severe parents and so gentle a schoolmaster. For when I am in presence either of father or mother, whether I speak, keep silence, sit, stand, or go, eat, drink, be merry or sad, be sewing, playing, dancing or doing anything else, I must do it, as it were, in such weight, measure and number, even so perfectly as God made the world, or else I am so sharply taunted, so cruelly threatened, yea, presently, sometimes with pinches, nips and bobs, and other ways which I will not name for the honour I bear them, so without reason misordered, that I think myself in hell till time come that I must go to Mr. Aylmer; who teacheth me so gently, so pleasantly, with such fair allurements to learning, that I think all the time nothing whiles I am with him. And when I am called from him, I fall on weeping, because, whatever I do else but learning is full of grief, trouble, fear and whole misliking unto me." Ascham did not see her again after this memorable interview. "I remember this talk gladly," he wrote, "both because it is so worthy of memory and because also it was the last talk that ever I had and the last time that ever I saw that noble and worthy lady." In his letters to his learned friends, however, he frequently commented on the sweetness of her character and the depth of her erudition. He spoke of Lady Mildred Cooke and the Lady Jane Grey as the two most learned women in England; and summed up his praises of the latter in the remark that "however illustrious she was by her fortune and royal extraction, this bore no proportion to the accomplishments of her mind, adorned with the doctrine of Plato and the eloquence of Demosthenes." Her high rank, strong piety, and precociousness caused Lady Jane to have great attention paid to her by leaders of the Reformed Church in England and abroad. Among the principal Reformers to have contact with and influence on her were Martin Bruce, whom Edward VI had made chair of the divinity at Cambridge, and Heinrich Bullinger, a Swiss reformer and head of the Zurich church. On one occasion the Princess Mary presented her with a sumptuous robe, which she was desired to wear in recognition of the donor's generosity. "Nay," she replied, "that were a shame, to follow my Lady Mary, who leaveth God's word, and leave my Lady Elizabeth who followeth God's word." A speech which the Lady Mary doubtless remembered. In 1553, as the fifteen-year old Edward VI lay dying, a series of events were engineered to install Lady Jane Grey as heiress to the throne. At the time, Edward’s legitimate successor was his older sister Mary, but her devotion to the Catholic Church caused the Reformers in and around the court much anxiety. John Dudley, the Duke of Northumberland, had aspirations for raising his son to the throne, and arranged a marriage between Jane and his son Guilford Dudley. The wedding took place in June at Northumberland’s palace in the Strand, and the Duke then persuaded Edward to exclude his two sisters Mary and Elizabeth from the throne via letters patent—and thus Jane became next in line for the crown. "How I was beside myself, stupefied and troubled, I will leave it to those lords who were present to testify, who saw me overcome by sudden and unexpected grief, fall on the ground, weeping very bitterly; and then declaring to them my insufficiency, I greatly bewailed myself for the death of so noble a Prince, and at the same time turned myself to God, humbly praying and beseeching Him that if what was given to me was rightly and lawfully mine, His divine Majesty would grant me such grace and spirit that I might govern it to His glory and service and to the advantage of this realm." But the reign of Queen Jane Grey would be short-lived. On the 19th of July, Edward’s sister Mary, who had previously been heiress to the throne, rode into London with a large number of supporters. Her claim to the throne was revoked, and, having been tried and found guilty of high treason, Mary imprisoned both her and her husband in the Tower of London. Believe not, man, in care's despite, That thou from others' ills art free The cross that now I suffer might To-morrow haply fall on thee. Endless all malice, if our God is nigh: Fruitless all pains, if He His help deny, Patient I pass these gloomy hours away, And wait the morning of eternal day. Mabie and Stephens give an endearing account of Lady Jane Grey’s final hours— an anecdote worth reprinting and with which we end. Mary and her advisers had originally intended that both Lady Jane and her husband should be executed together on Tower Hill; but reflection convinced them that the spectacle of so comely and youthful a pair suffering for what was rather the crime of others than their own, might powerfully awaken the sympathies of the multitude, and produce a revulsion of feeling. It was ordered, therefore, that Lady Jane should suffer within the precincts of the Tower. The fatal morning came. The young husband—still a bridegroom and a lover—had obtained permission to bid her a last farewell; but she refused to see him, apprehensive that so bitter a parting might overwhelm them, and deprive them of the courage needful to face death with calmness. She sent him, however, many loving messages, reminding him how brief would be their separation, and how quickly they would meet in a brighter and better world. In going to his death on Tower Hill, he passed beneath the window of her cell; so that they had an opportunity of exchanging a farewell look. He behaved on the scaffold with calm intrepidity. After spending a brief space in silent devotion, he requested the prayers of the spectators, and, laying his head upon the block, gave the fatal signal. At one blow his head was severed from his body. The scaffold on which the girl-queen was to close her stainless career had been erected on the green opposite the White Tower. As soon as her husband was dead the officers announced that the sheriffs waited to attend her thither. And when she had gone down and been delivered into their hands, the bystanders noted in her "a countenance so gravely settled and with all modest and comely resolution, that not the least symptom either of fear or grief could be perceived either in her speech or motions; she was like one going to be united to her heart's best and longest beloved." So, like a martyr, crowned with glory, she went unto her death. Her serene composure was scarcely shaken when, through an unfortunate misunderstanding of the officer in command, she met on her way her husband's headless trunk being borne to its last resting-place. "Oh Guilford! Guilford!" she exclaimed; "the ante-past is not so bitter that you have tasted, and that I shall soon taste, as to make my flesh tremble; it is nothing compared to the feast that you and I shall this day partake of in heaven." This thought renewed her strength and sustained and consoled, we might almost believe, by ministering angels, she proceeded to the scaffold with as much grace and dignity as if it were a wedding banquet that awaited her. "Go now; God grant you all your desires, and accept my own warm thanks for your attentions to me; although, indeed, those attentions have tried me more than death could now terrify me." To the spectators she addressed a few gentle words, in admirable keeping with the gentle tenor of her life. "Good people," she exclaimed, "I am come hither to die, and by law I am condemned to the same. My offence to the Queen's Highness was only in consent to the device of others, which now is deemed treason; but it was never my seeking, but by counsel of those who should seem to have further understanding of things than I, who knew little of the law, and much less of the titles to the Crown. I pray you all, good Christian people, to bear me witness that I die a true Christian woman, and that I look to be saved by none other means but only by the mercy of God, in the merits of the blood of His only son, Jesus Christ; and I confess, when I did know the word of God, I neglected the same, loved myself and the world, and therefore this plague or punishment is happily and worthily happened unto me for my sins; and yet I thank God of His goodness, that He hath thus given me a time and respite to repent. And now, good people, while I am alive, I pray you to assist me with your prayers." She knelt to her devotions, and turning to Feckenham, inquired whether she should repeat the Miserere psalm (the fifty-first, "Have mercy upon me, O Lord"). He replied in the affirmative; and she said it with great earnestness from beginning to end. Rising from her knees, she began to prepare herself for the headsman and pulling off her gloves, gave them and her handkerchief to Mistress Tylney. The manual of prayers, in which she had written at the desire of the Lieutenant, she handed to Thomas Brydges, his brother. When she was unfastening her robe, the executioner would have assisted her, but she motioned him aside, and accepted the last offices of her waiting-women, who then gave her a white handkerchief with which to bandage her eyes. "Will you take it off before I lay me down?" "What shall I do? Where is it?" In an instant the axe fell, and the tragedy was consummated. An involuntary groan from the assembled multitude seemed to acknowledge that vengeance had been satisfied, but justice outraged. Lady Jane—or Queen Jane, as she should more properly be called —was little more than seventeen years old when she thus fell a victim to Mary's jealous fears and hate. She had hardly entered upon womanhood, and the promise of her young life had had no time to ripen into fruition. We may well believe, however, that she would not have disappointed the hopes which that promise had awakened. Her heroic death showed how well she had profited by the lessons she had imbibed in her early years. There was no affectation, no exaggeration, in her conduct upon the scaffold; but she bore herself with serene dignity and with true courage. It was worthy of her life—which, brief as an unhappy fortune made it, was full of beauty, full of calmness, and truth, and elevation and modest piety. The impression which it made upon her contemporaries, an impression taken up and retained by posterity, is visible in the fact to this hour we speak of her as she was in her sweet simple maidenhood—we pass over her married name and her regal title, and love to honour her, not as Lady Jane Dudley, or Queen Jane, but as Lady Jane Grey. Biographical information and all quoted material are taken from Hamilton Wright Mabie and Kate Stephens, Heroines Every Child Should Know (1908). Alison Plowden, "Grey , Lady Jane (1537–1554)." Oxford Dictionary of National Biography. Ed. H. C. G. Matthew and Brian Harrison. Oxford: OUP, 2004. Online ed. Ed. Lawrence Goldman. Oct. 2008. Oxford Dictionary of National Biography entry on Lady Jane Grey written by Alison Plowden. This comprehensive biographical record includes a list of other sources and archive materials related to Lady Jane Grey. David W. Bartlett, The Life of Lady Jane Grey. New York: C. M. Saxton, 1858. David W. Barlett's comprehensive biography about Lady Jane Grey. Includes a detailed account of the political circumstances that influenced her life. Full-text edition provides the author's preface. Link accessed through Google Books. Ida Ashworth Taylor, Lady Jane Grey and Her Times. London: Hutchinson & Co., 1908. Ida A. Taylor's (author of Life of Madame Roland) detailed biography about Lady Jane Grey. Chapters follow a chronology of the political events that determined the course of her short life. This digitized, full-text edition includes seventeen illustrations. Text linked through Google Books. 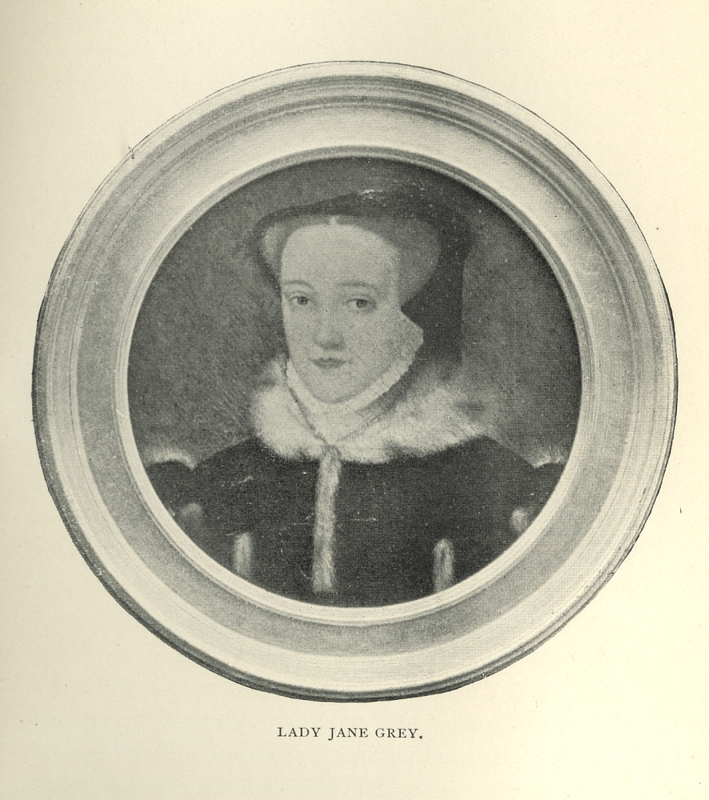 Jane Lambert, "Lady Jane Grey: The Nine Day Queen." 2003. Website devoted to the life and short reign of Lady Jane Grey. Includes a biography, timeline of milestone events and outlines the order of succession that led to Lady Jane Grey's coronation. Website also provides a list of further reading and links to other sources. Marilee Hanson, "Lady Jane Grey: Biography, Portraits, Primary Sources." English History. 1997. From the English History website, this internet source includes a biography and images of Lady Jane Grey as well as eyewitness accounts from her coronation and execution. Website also provides a link to The Lady Jane Grey Internet Museum. Nicholas Harris Nicolas, ed., The Literary Remains of Lady Jane Grey: With a Memoir of Her Life. London: Harding, Triphook, and Lepard, 1825. Biography about Lady Jane Grey, edited by Nicholas H. Nicolas, which includes her memoirs as well as letters and literary works attributed to her. Nicolas also provides transcriptions of a prayer composed by Lady Jane Grey shortly before her exectution as well as her speech from the scaffold. Full-text edition linked through Google Books. Philip Sidney, 'Jane the quene': Being Some Account of the Life and Literary Remains of Lady Jane Dudley Commonly Called Lady Jane Grey. London: S. Sonnenschein, 1900. Philip Sidney's biography about Lady Jane Grey, including notes from her prayer-book as well as a sketch of her character inferred from the nature of her letters and literary works. Text includes geneological tables and short biographies of central figures associated with her life. Sidney also discussed inscriptions in the Tower of London which have been attribiuted to Lady Jane Grey. Text linked through Google Books. Richard Davey, The Nine Days' Queen: Lady Jane Grey and Her Times. London: Methuen & Co., 1909. Richard Davey's biography about Lady Jane Grey, focusing on the central figures and conspiracies that impacted her life. Text includes a note by the author and a scholarly Introduction by Major Martin Hume which discusses the political environment in England during the time of Lady Jane Grey's life. Full-text edition linked through Internet Archive. Thomas Wilkins, The History of Jane Grey, Queen of England: With a Defence of Her Claim to the Crown. London: T. Wilkins, 1792. Thomas Wilkins' biography about Lady Jane Grey, focusing on her claim to the crown as well as her deposition and trial. Wilkins also includes elegies composed about Lady Jane Grey as well as sketches of her character written by other historians. Full-text edition provides the author's preface. Linked through Google Books.